Training the next generation of scientists is at the heart of the CRUK Lung Cancer Centre of Excellence at Manchester and UCL. The Centre provides a comprehensive PhD postgraduate training programme, with a strong focus on lung cancer molecular biology, to develop clinical and non-clinical academics of the future. The training programme covers a range of different technologies, providing a substantial competitive advantage for obtaining positions at the next career level. 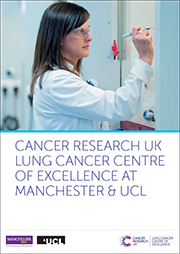 Through the Manchester/UCL Clinical Research Training Fellowship schemes, graduate students with clinical backgrounds will be encouraged to pursue research in lung cancer related programmes. The partnership enables us to offer challenging and stimulating projects in a wide range of lung cancer related research areas. Our unrivalled expertise and facilities present the opportunity to work closely with world-leading research scientists and clinicians, whilst having access to state-of-the-art laboratories. Each PhD student will have the opportunity to undertake core training at both Manchester and UCL sites where joint supervision ensures a supportive environment that encourages students to flourish as they move towards becoming independent researchers. Current opportunities are advertised here. An active seminar series and a wide range of skills and development courses encourages intellectual and social interaction between students. The annual CRUK Lung Cancer Centre of Excellence Workshop also provides PhD students, Clinical Fellows and post doctoral scientists with the opportunity to hear about world-leading lung cancer research, formally present their work and receive constructive feedback from senior colleagues and internationally renowned leaders in their own field.